Howard University has produced a number of exciting playmakers at the quarterback position over the last several decades. Some schools specialize in producing players at certain positions. Sometimes it’s defensive backs, other times its running backs, and others even come up with great linemen. Howard University is a school known for academics, but it has also produced quite a few lethal quarterbacks over the last few decades. It has not always translated into championships, but there is enough precedent to put it among the nominees. If you’ve ever watched him call a game on The Four Letter Network, you know that before Jay Walker was in the booth calling games, he was a stud on the field at Howard University. The Los Angeles native began his college career at Long Beach State University in 1991 after taking a year off to pursue a pro baseball career. He played in one game at the school before it decided to end its football program, leaving Walker to look elsewhere to continue his career. He chose Howard, or rather his mother chose it for him. Walker quickly wrote his legend in HU and MEAC lore once he arrived at the Hilltop. He was named All-Conference his first season with the Bison in 1992, setting the stage for an epic 1993 season. That year he led Howard to a perfect regular season where the team ranked as high as no. 8 in Divsion I-AA. He had several epic games during that season, including a memorable battle with Steve “Air” McNair and his game-sealing run over North Carolina A&T during this homecoming game on BET. Walker would be drafted by the New England Patriots in the seventh round of the 1994 NFL Draft. He spent four years in the pros before moving into television via BET and MBC before being brought on to The Four Letter Network. A star at West Charlotte High School, Hamilton’s time at Howard was marked between two legends in the 1990s. He served as the on-the-field bridge between the Jay Walker and Ted White eras, and eventually joined coach Steve Wilson’s staff as quarterbacks coach in 1997. He was promoted to offensive coordinator for the 1999 season and remained in that role until 2001 when he began to intern for NFL teams. Since then he’s coached at the NFL as an offensive coordinator for the Colts and in the FBS. He is now the head coach of the XFL’s Washington Valor. Howard’s next great quarterback was just around the corner, at least in terms of time. Ted White actually grew up in the shadow of emerging SWAC power Southern in Baton Rouge, Louisiana. He ended up in DC where he re-wrote the school and conference record books. After a season-ending kidney injury during the 1995 season, White rebounded big time in his sophomore season, throwing 36 touchdowns while leading Howard to the Heritage Bowl. White threw for better than 3,200 yards and completed 58 percent of his passes as a senior, including an epic 527 yard performance against FAMU. He finished with 9,908 passing yards for his career, which stands as a MEAC record more than two decades after his last game. He also had the career record for total yards of offense before being passed by Greg McGhee (see below). White went on to play several seasons in NFL Europe before getting into coaching. He helped coach McGhee to break his records as his offensive coordinator for former teammate Flea Harrell and is now the offensive coordinator and quarterbacks coach for Prairie View A&M. McGhee may have been the most talented player on this list in terms of his ability to both run and throw the ball. The Pittsburgh native burst on the scene at Howard as a freshman, helping the team finish second in the MEAC. His senior year was one for the books as he completed 222 of 399 passes for 2,388 yards and 15 TDs and only eight interceptions while connecting on 56 percent of his passes. He also rushed for 847 yards and a career-best 13 TDs. McGhee holds the MEAC record in career total offense with 10, 168 yards. He is also the record holder for passes attempted and completed in a career. He finished 731 of 1,296 passing for 7,589 yards and 49 TDs and gained 2,579 rushing yards on 535 carries with 26 TDs. 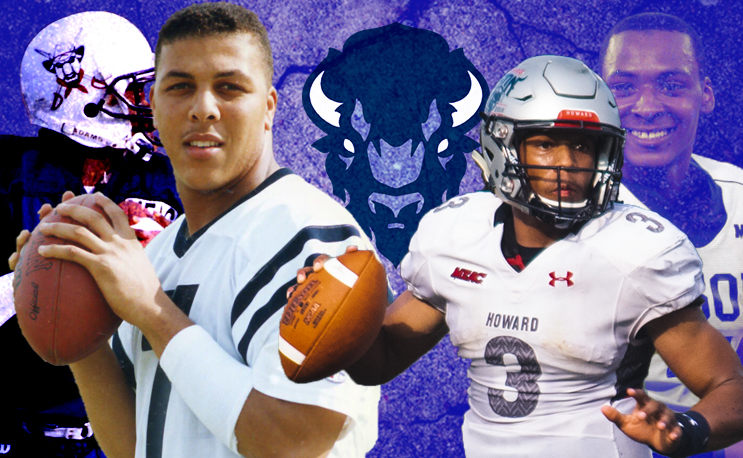 The bar on great quarterbacks at Howard continues to rise and Caylin Newton has already contributed to that in his short time there. Newton was recruited by Harrell who was gone by the time he arrived on campus, ultimately replaced by former Richmond and UVa coach Mike London. Newton wrote himself into the history books in his first game, leading Howard to a win over FBS UNLV in what was revealed to be the biggest upset in the history of college football. He would finish his freshman campaign with over 3,000 yards of total offense, winning MEAC Rookie of The Year Honors. The 2018 campaign didn’t see any monumental wins, but Newton continued to put up big numbers, throwing for 2,629 yards and 22 touchdowns, both of which were improvements on his freshman year. He’s still got a ways to go before he pulls himself up this list, but with one MEAC Offensive Player of The Year already under his belt, he’s well on his way to making sure his name stands out in his own right.